The Grand Chess Tour was launched but didn´t add any new event, as Stavanger, St. Louis and London had already been on the map of top chess before. The same players kept playing each other, several of them were in poor shape, and the rules of the Tour look flawed. Three players had higher scores than the eventual winner of the series, Magnus Carlsen, who even dropped twenty rating points on the way. 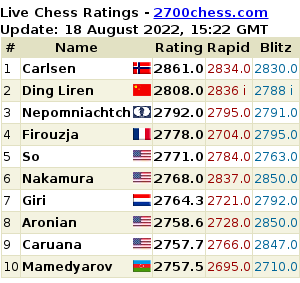 has managed as number 357 of the ranking list to beat then number two ranked Nakamura as well as World Champion Carlsen within a couple of weeks. has contributed a top score on the top board for Siberia Novosibirsk to win the European Club Cup and has finished the year on place two of the rating list. has produced the top individual performance of the year in the World Cup. would have been a deserved winner of the World Cup, at least he qualified for the Candidates. He also lead Russia to the European Team title. He was not invited to major tournaments, but he proved that he is the uncrowned king of chess commentary. has finally established himself in the top ten. Lucky to be offered a place in the Grand Chess Tour after Kramnik and So declined he proved his worth by scoring half a point more over three tournaments than the overall winner. The Frenchman also came victorious in Biel. was in poor shape at the end of the year, but the American had earlier climbed up to 2814 in the rating list thanks to victories in Gibraltar, Zurich, Las Vegas and a shared win in Khanty-Mansiysk that secured him a place in the Candidates. steadily climbed up in the rating list and is currently the highest rated participant of the Candidates, which is starting in less than eleven weeks. He was the only unbeaten player in the Grand Chess Tour where he scored one and a half points more than anybody else. overcame a bad streak by winning one of the year´s top events in St. Louis. He lead the Armenian team to win medals at the World Teams and the European Teams Championship. He also lead his compatriots to compete in Azerbaijan for the first time in 25 years at the Baku World Cup to bring the two nations a bit closer. is the indisputed world champion and rating leader in spite of a few shaky results. He has won six tournaments in 2015, which is more than any of his rivals and would be more than sufficient to be number one of this list, if I would not want to make a certain point. is my player of the year. As the youngest ever he broke the 2700 bareer before completing his sixteenth birthday. His spectacular king hunt against Bruzon was probably the game of the year. He contributed the highest score of all participants to China becoming World Team Champion. He won the Chinese Championship, Leon and Wijk aan Zee, although the latter was only the B Group. The point is that Wei was not invited to a single top tournament. 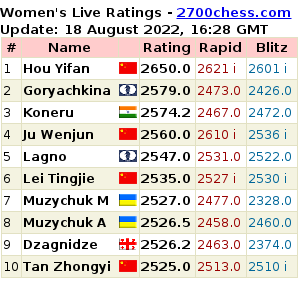 It is a shame that the young Chinese player, who could well be the next world champion, has been sidelined by the organisers. Stefan Loeffler is a veteran chess journalist from Germany and Programme Director of the London Chess Conference. Submitted by Mark Watkins on 3 January, 2016 - 17:59. "The point is that Wei was not invited to a single top tournament." I'm not sure this is actually true. Navigating the Chinese system and hierarchy to get a 16-year-old to come abroad is not easy. Invitations are not always the same as acceptances. Given that Wei Yi played 113 classical games, and various other events (like Leon), it's hard to say that he wasn't in demand. I don't have a list of the top 10 events of the year at hand, but I'd guess that Danzhou was close to that. By some standards, you could say that Svidler had no invites, similarly Tomashevsky (Russian champion and winner of a GP event), Harikrishna only the midrange Edmonton, Gelfand and Li Chao had only matches, etc. Why single out Wei Yi, other than his youth? Given that he'll play in Wijk aan Zee group A in 2016, what's the rush? He already did a lot of travelling for the year, so maybe he just preferred to spend the summer playing in China, rather than something like Havana, Dortmund, or Biel.